IE Foundation Humanities Prizes 2016 were awarded on the evening of Thursday September 22nd at the Ritz Hotel Madrid. The event was attended by a large audience consisting of the winners, their families, jury members and IE’s International Advisory Board. 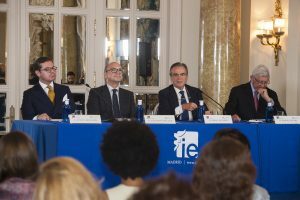 The ceremony began with the institutional notes by IE Foundation President Diego de Álcazar and Vice President Rafael Puyol. The President’s speech focused on the importance that IE gives to the Humanities, a central part in both academic and extracurricular life. In his words “the Humanities enhance the qualities students need to excel in their future careers”. Vice President Puyol offered an overview of the IE Foundation’s work and of the Prizes. As a piece of advice he remenbered Leonard Cohen’s words when receiving the Prince of Asturias Award for Literature: “Being awarded is not the end of anything –it is only a tool that will allow me to keep doing better what I have been awarded for”. After the institutional notes the Prizes were given to the winners. Besides the Honorary Merit Diploma all winners will receive 100 copies of th book contaning all awarded works. 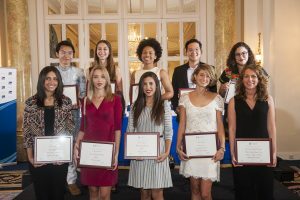 Once all the works the diplomas were delivered the first prizes in Poetry and Short Story proceeded to read their winning works, the poems in f ull and excerps of the short stories . All readers carried on the task with extreme passion and dramatic skills – special mention deserves LLB student Joy Cierrea Archer Holmes for her impressive recital. 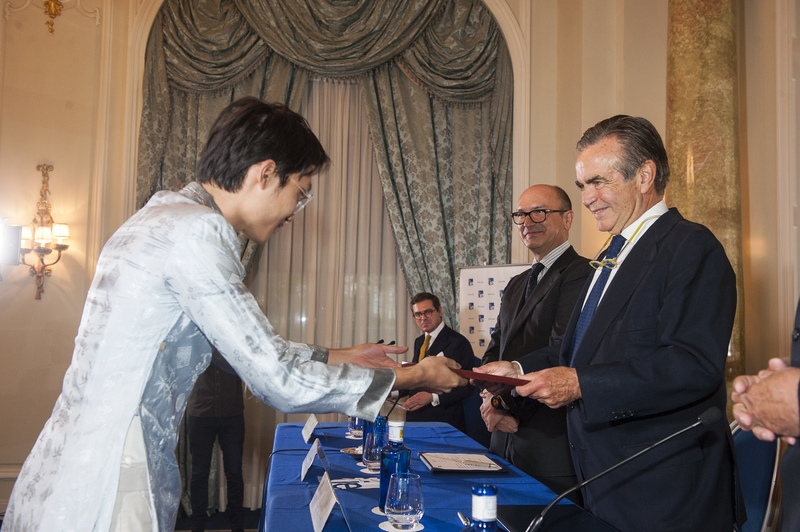 The event was closed by the President congratulating the winners, calling the IE Foundation Humanities Prizes 2017 and inviting all attendees to share their views with the award winners in a cocktail served at the hotel’s garden. List of winners. Short Story in Spanish: 1st. María Isabel Macías Núñez (MCC 2016) for “Un hombre con el abrigo largo”. 2nd. Elisa Carrara (MVDM 2016) for “Una expresión sardónica”. 3rd. Sofía Quetglas Diz (MIM 2016) for “De vuelta a Barcelona”. 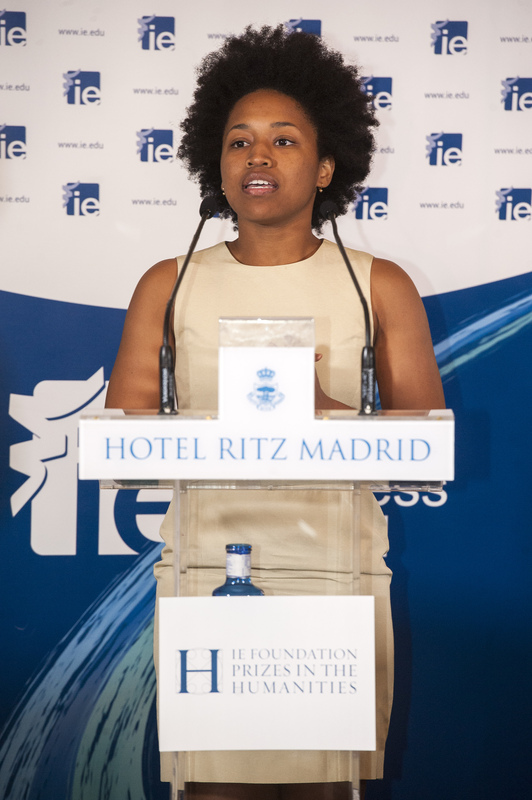 Special mention to María Isabel Macías Núñez (MCC 2016) for “Muerte en María de Molina”. Short story in English: 1st. Do Xuan Hoang (BAR 2020) for “Aroma”. 2nd. Alyssa Flora Najafi (MVDM 2016) for “Death Valley”. 3rd. Marieke Elisah Lensvelt (MVDM 2016) for “The Other Side”. Poem in Spanish: 1st. Sofía Rondán González (MIR 2016), for “Nadie”. 2nd. María Isabel Macías Núñez (MCC 2016), for “Primer round”. 3rd. Jesús Arcenegui Méndez (Madrid, Spain, 1997, Bachelor in International Relations, 2019) for “Quiero”. Poem in English: 1st. Joy Cierrea Archer Holmes (LLB 2017), for “Beautuful Imperfectiums [sic]”. 2nd. Sumedha Sharma (MCC 2016), for “One Place – A Haiku”. 3rd. Malak El Halabi (MMRCB 2016), for “23”. Photography: 1st. Nathalie Lagard (BAR 2017) for “Rendez-vous”. 2nd. Romain O. Lepoutre (BAR 2019), for “Hangman”. 3rd. Jazmin C.Harb Andrade (MVDM 2016) for “Dancejazz”. Video: 1st. Montserrat Gutiérrez Mesegue (BAR 2018) for “Apparently”.